Welcome to the website of the Tazewell County, Illinois Emergency Telephone System Board. The Tazewell County Emergency Telephone System Board, commonly referred to as the Tazewell County 9-1-1 Board or ETSB, is responsible for the implementation and maintenance of the 9-1-1 telephone system in Tazewell County, Illinois. Tazewell County is located in central Illinois, approximately midway between Chicago and St. Louis. Tazewell County covers 658 square miles with a 2010 census population of 134,800 residents. 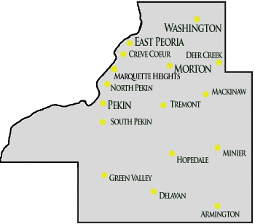 It is the responsibility of the Tazewell County Emergency Telephone System Board to deliver 9-1-1 service to residents of the following communities: Armington, Creve Coeur, Deer Creek, Delavan, East Peoria, Green Valley, Groveland, Hopedale, Mackinaw, Marquette Heights, Minier, Morton, Pekin, North Pekin, South Pekin, Tremont, Washington and all unincorporated areas of Tazewell County. The mission of the Tazewell County Emergency Telephone System Board is to plan, implement, control, maintain and upgrade to meet the current and future demands of the 9-1-1 telephone system for the entire County of Tazewell.